Enjoy the Yorkshire Dales in the comfort of The Old Hayloft this Autumn and Winter. One week has become available again in September – see availability and tariffs for information on dates and prices. Limited weeks left so treat yourself this Easter and book your summer holiday. The Old Hayloft is nearly booked for summer! Only a couple of weeks left in July so book now to enjoy this beautiful cottage and its surroundings. Celebrate the Tour de France in style! Flexible accommodation available for the Tour de France week. The Old Hayloft can be booked for the week from Friday 4th – 11th July. Minimum 4 days £400.00, for the week £600.00. Prime location to view the tour, whilst being in the heart of the splendour of the Yorkshire Dales. 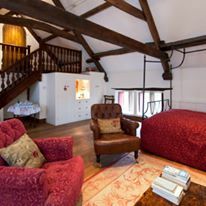 Book your Easter break at The Old Hayloft. The perfect time to visit Yorkshire as the spring blossoms! Lots to see and do and also a little time to relax in amazing comfort. Beat the price increase and book your holiday! Our prices have remained the same for the last two years but, due to rising costs, rates will be increased from the 1st January 2014. However, if you book your holiday for next year before December, then this year’s prices will be held. Although you are on holiday and probably want to escape the trappings of modern-day life, we have now installed Wi-Fi with unlimited use. Two weeks available in July…..
due to a cancellation there are now two weeks available from July 20th – August 3rd (please do not refer to the calendar on the website as it still shows as booked). Contact us at hr0448@hotmail.com to reserve either or both of these weeks.